The enzyme is very active under a wide range of reaction conditions and difficult to inactivate. 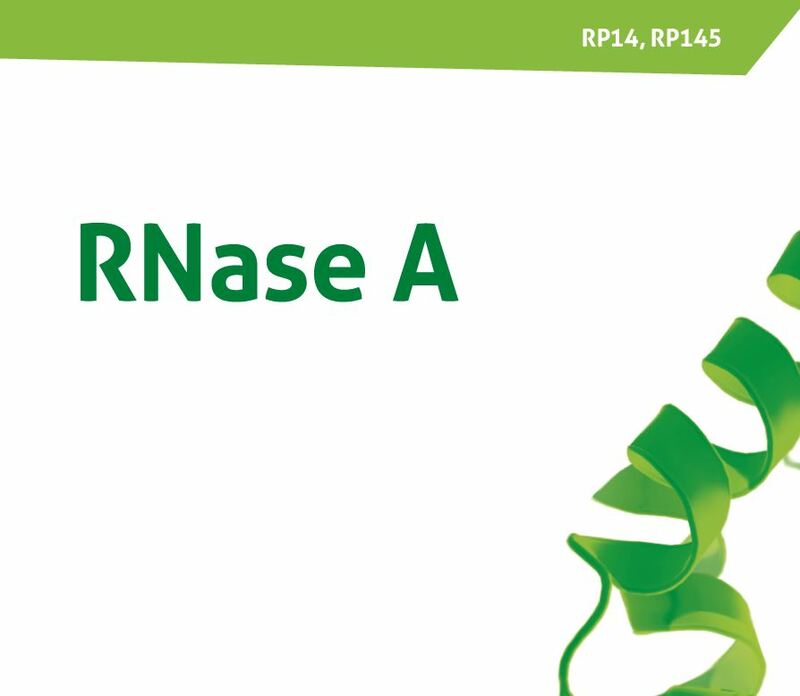 At low salt concentrations (up to 100 mM NaCl), the RNase A cleaves single- and double-stranded RNA as well as an RNA strand in RNA-DNA hybrids. However, under high salt concentrations (>300 mM NaCl), the RNase A specifically cleaves single-stranded RNA. One unit of activity is defined as that amount of enzyme which causes the hydrolys is of RNA to yield a velocity constant, k=1, at 25°C and pH 5.0 (Kunitz-Unit). Stock solutions should be prepared to a final concentration 1 – 10 mg/ml by resuspending in 10 mM Tris-HCl (pH 7.5), 15 mM NaCl, 50% (v/v) glycerol or in TE buffer. The recommended working solution concentration depends on application. For removal of RNA from plasmid preparations use 10 μg/ml working solution and incubate sample for 1 hour at room temperature. For preparation of „blunt ends” of double-stranded cDNA use 100 ng/ml working solution. Keep at -20°C (lyophilized or in a 50% glycerol solution) for long-term storage or at +4°C for up to several weeks. When stored at -20°C (lyophilized or in a glycerol solution), the enzyme remains stable for several years. The RNase A has a high affinity to glass surfaces. At neutral pH & high concentrations (>10 mg/ml) the enzyme will precipitate. The enzyme is inhibited by diethyl pyrocarbonate (DEPC), guanidinium salts (4 M GuSCN), β-mercaptoethanol, heavy metals and RNase-inhibitors like RIBOPROTECT Hu (RT35). In order to remove the enzyme from a sample, perform a separation with spin columns or several phenol/chloroform extractions. The activity of the enzyme, absence of deoxyribonucleases and proteases has been confirmed in appropriate quality tests.